Designed & Made In our USA AS9100D Aerospace Quality Production Facilities. ► Beware of competitors as some are banned in the USA due to embedded spyware. ► Insist on the Enable-IT Brand, trusted by respected security experts worldwide. The Enable-IT 860 PRO Gigabit Black Box Ethernet Extender over copper is the highest-throughput encrypted and Secure Ethernet Extender on the PLANET bar none! Designed & Made in the USA with quality and pride. 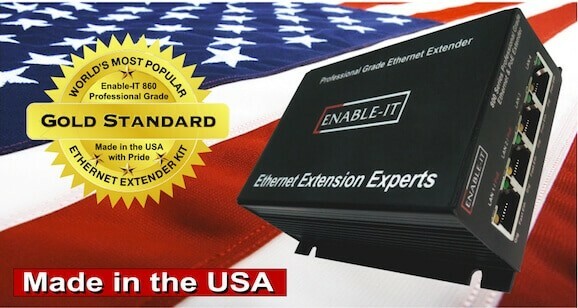 These American-made Enable-IT 860 PRO Gigabit Black Box Ethernet Extender over copper uses industry LAN standard RJ-45 (8-pin) connectors to make installing in most any environment very easy. We have engineered most of the technical complexity into automatic line adjustments so the plug and go simplicity on your existing or new wiring is a snap. Beware of Cheap Chinese "so called Business Use" (not even suitable US Home use) gear that is banned in the US due to proven hidden spyware. Typically low cost CAT 2 Telephone wire all the way up to CAT 7 rated twisted pair can be used vs expensive fiber that can't support power transport. Outdoor IP68 Rated Waterproof 860W PRO. Enable-IT is the seminal creator and inventor of Ethernet Extender and PoE Extender concepts and technology. We are the original trusted and respected source worldwide. With a 45-day money-back guarantee and Same Day Insured and Tracked Shipping, you have nothing to lose. for under $1 per month! - US AS9100D Aerospace Quality Factory Floor Direct. from device extension to device extension, encrypted and secure. throughput @ 300Mbps vs G.Hn Technology. ► Can be daisy chained to extend infinitely in linear or tree topology. equipment. Can be different on each end. 5) Interlink wire type for number of twists per spec on Category rated. i.e. 6) Interlink wire pair used - same twisted pair bundle or mixed pairs. (PEO C3T) provides our US soldiers with the reliable communication networks they require to fight and win our Nation's wars. We develop, acquire and field a range of integrated specialized communications systems including the Enable-IT products. The Enable-IT 860 PRO kits have been a very successful and reliable component in our deployments worldwide. Being in the Oil, Gas and Chemical (OG&C) Industry our clients demand the highest ruggedized standards and operational reliability. EnableIT 860 kits have been our solid goto equipment for extending LANs for almost a decade. - You get what you pay for, and these have been well worth it many times over.